The origins of Salsa (which literally means sauce in Spanish) can be traced as far back as the civilizations of the Aztecs, Mayans, and Incas. The Spaniards first recorded encountering salsa around in the early 1500s. However the inhabitants of Central America had been mixing up their favorite salsa dishes for many centuries before that. The Aztecs were one of the first peoples to domesticate the tomato. Their original sauces were a mix of chiles, tomatoes, squash, and beans, among other indigents. The Aztecs passed these traditions on to later cultures in Central America and eventually the United States. 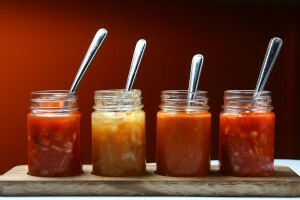 In 1807, the first bottled hot sauces made their appearance in Massachusetts. This first sauces were based on Cayenne chiles. In 1868, Tabasco sauce made its debut performance on a small Island a little west of New Orleans. Around the turn of the century cookbooks are reported to have published recipes for salsa and competitors in the hot sauce market began arising. In 1948, Texas became the home to the first salsa manufacturing site in the United States. Salsa really started taking off in the 1980s. In fact, between the years 1985 and 1990, salsa sales increased seventy-nine percent. The momentum increased as 36 percent of American households were buying salsa in 1992 (up from 16% in 1988). The increase in popularity of Mexican restaurants and cantinas which always have salsa have helped in become a household item. Now salsa is one of the most popular condiments along with ketchup, mustard, and mayonnaise. You can find it in any store and almost every home. One of the great things about salsa is that it is fun to make yourself (as opposed to ketchup and mayonnaise, neither of which is fun to make yourself). Here are a few fun recipes to try out like our homemade chips and salsa, our fresh salsa recipe, and our vegetarian taco salsa. If reading about the history of salsa is enough to make you hungry, you are in luck. For some of the best chips and salsa around, come check out Acapulcos Mexican Restaurant and Cantina in one of our many different locations across Massachusetts and Connecticut! Our salsa is a delicious blench of flavors, sauces, spices, and a few secret ingredients you can’t get anywhere else. You can check out our menus to get an idea of what you want before you come.